Lúc đầu thấy đăng tin trên facebook, mình cứ tưởng hắn nói đùa. Sau đó hai tên kia cứ cuống quýt lên nào là chụp ảnh cưới, nào là ăn hỏi, nào là chuẩn bị cưới… Tất cả chỉ diễn ra trong vẻn vẹn 1 tháng kể từ khi ra quyết định tới lúc thực hiện quyết định. Đến chiều nay mới biết, bụng cô dâu cũng đã lùm lùm… Và cái “ngày đặc biệt” trên status của tên kia là ngày hai kẻ đó biết mình sắp lên chức bố mẹ. Nhìn quanh quẩn, thấy chẳng còn mấy đứa ăn chơi nhảy múa. Chẳng bao lâu nữa sẽ chỉ còn mình mình. 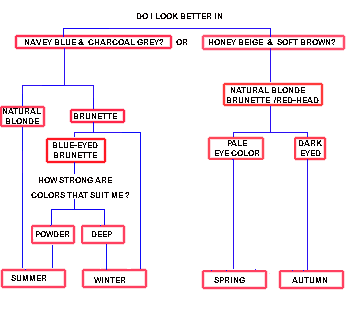 How to determine the Colors that are Best for YOU! Your Coloration has a “Icy Nuance, Intrepid and distinctive” Winters are intense and rich in their coloring and have the best profile for power dressing because they look great in all the power colors black ,navy, charcoal. People with “Winter” coloring are usually brunette’s, although natural white-blondes may also be winter’s. Winters often have porcelain white or very pale skin, or olive skin (with a yellowish tinge)… the latter often look good in the deepest winter colors. People of color may also be winter. Typically people who have your color profile have depth to their coloring and a lot of contrast between their hair color, eye color and skin tone. You will look best in intense deep, rich colors accented with jewel tones, or contrasted with bright white or icy pastels. Look for a dark suit with cool undertones like dark navy, charcoal and even black. Your coloring will be complimented by these deep, powerful colors. Never dress in earth tones, muted or powdery colors; they will make you look faded and sallow. When choosing colors, look for jewel tones and bright, vivid colors, or colors with cool icy tones to them. 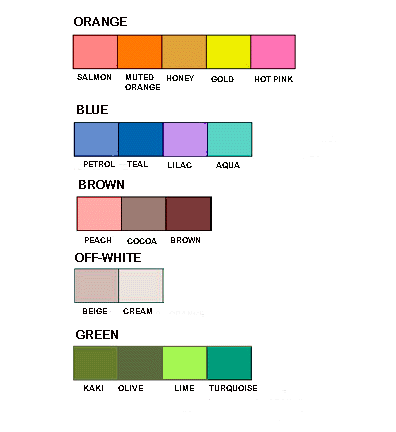 For dress shirts, this means very bright whites, icy blues, pinks and yellows. For fun and style expression try French blue or charcoal. Accents should be vibrant, and intense jewel tones. Be bold! Try wearing wear emerald green, ruby red, fuchsia, royal blues, for your sportswear In all instances the colors are intense and rich. Black or Cordovan for dress. Black, navy, or burgundy for casual wear. Intense jewel tones and deep, rich colors accent. Never wear earth tones or muted, cloudy colors. People with “Summer” coloring are usually natural blondes, although extremely pale-skinned brunettes with pale blue eyes are often summer’s. Summers often have porcelain white or very pale skin, or pale skin with pink cheeks. A dark blonde summer with slightly darker skin will be able to wear darker colors than a very fair summer. A dark summer can wear burgundy, deep royal purple and some of the colors that overlap with the winter colors. Typically people who have your profile have a low level of contrast between their hair color, eye color and skin tone with, cool undertones of pink or blue. For you to look your best, choose soft, muted colors with cool undertones. You should strive for blended shades like heather gray and slate blue. Avoid intense, clear colors because they will appear too harsh on you. When choosing a suit, you should look for toned-down colors like subdued navy blue, softer grays, blue-grays, charcoals, and rose browns. Your image will be complimented by these dusty colors instead of being overpowered. You should never dress in vivid or saturated colors, for they will drown you out. Nor should you ever wear earth tones. 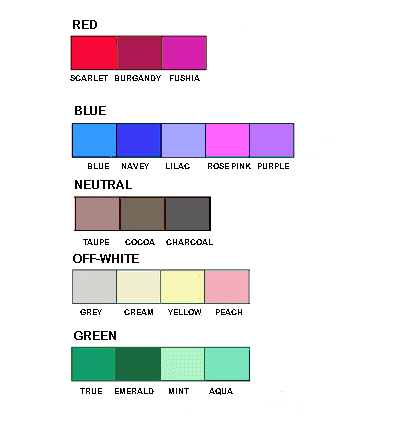 Your shirt colors should be soft like powder blue, dusty pink, mauve, pale yellow, lavender and soft white. Choosing the correct colors will give you a harmonious attractive pulled together look. Bringing you into the forefront. Rose brown, black, and burgundy for dress, as well as navy and gray for casual wear. Burgundies, grays, soft yellow, muted pinks, dusty rose or cool neutrals for a conservative look. Never wear bright, vivid or spice colors. People with “Autumn” coloring have varied coloring – ranging from golden blondes to brunettes and black hair coloring. Red-heads, excluding very fair auburn and strawberry blondes, are usually autumns. All red-heads are autumn or spring’s. Red-headed autumns often have porcelain white or very pale skin. Autumns can also have a ruddy skin with orange tones or swarthy skin. Autumns cover such a large range of colorings, fairer autumns may look best in the oranges and turquoise, whereas black-haired or dark brunette autumns may look good in the deeper chocolate browns, olive green and deep orange reds. Typically people who have your profile have a lot of depth to their coloring and a spicy, earth tone quality to their hair color, eye color, and skin tone. Your complexion will be accented by rich golden, spicy and earthy colors. You can wear both muted and rich, warm colors like the autumn foliage or exotic spice colors. Look for a warm golden undertone when choosing a color. When choosing a suit, you should pick warm, muted colors like marine navy blue, olives, golden browns and rich warm grays. 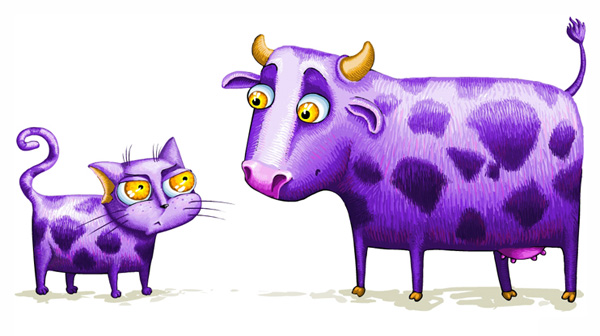 Your image will be complimented by these harmonious environmental colors instead of clashing. Avoid clear bright colors, pure white and black which will make you look tired and faded. 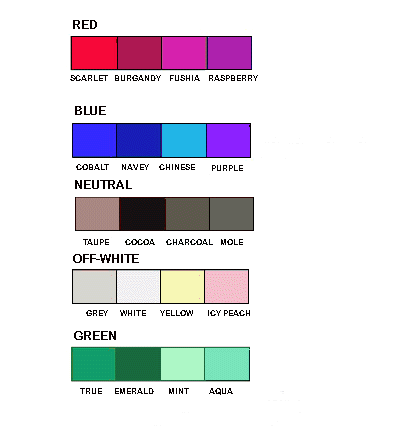 Also, avoid true pastel colors which will look cold against your complexion, giving you a pale and sickly appearance. Your dress shirts, in particular, should not be true white for this reason. Choose oyster and ecru (eggshell) instead. All shades of brown and golden tan. Brown, black, and reddish brown for dress. Brown or luggage color for casual wear. Add beige and oyster for warm weather. Rich, spicy and warm shades such as fiery reds, rich burnt oranges, olives, intense shades of gold, and turquoise. Any earth tone can be an accent. Avoid black, white, and pastels. Your Coloration is “Sunny, Luminous, And Transparent”. Your smile alone will brighten a day. People with “Spring” coloring are usually natural golden blondes or auburn or strawberry blonde red-heads although very fair blue/ aqua eyed brunettes are sometimes spring. Springs have extremely light skin color and pale or very clear- pale eye color. Springs can wear very pale soft colors, such as peach, golden browns, aqua. Slightly darker springs, especially brunette springs, can wear the lime green and sometimes some of the paler autumn colors e.g. orange. Typically people who have your profile have clear, warm, golden undertones. They usually have ivory skin with a hint of coral in their cheeks. Colors appropriate for you are bright, vivid and clear with warm undertones. When choosing a suit, you should pick clear, true colors like cadet navy, or golden shades like olive, golden brown, camel, and warm grays. 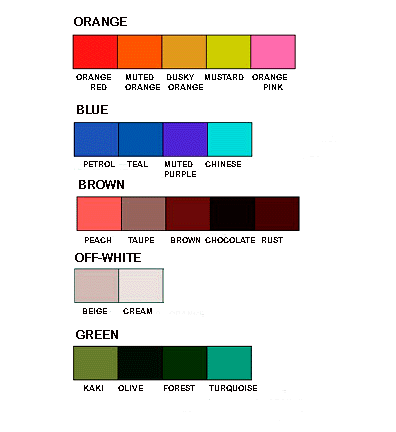 Your colors are particularly hard to find because they can never be muted or too dark. Your colors should look “alive”. Avoid black and pure white–they will be heavy and too contrasting for you. When choosing casual or sportswear look for for lively, bright colors. People of your coloration need a hint of gold in their colors. When choosing accent colors, look for bright greens and yellows, true reds and clear blues, as well as corals and oranges. For dress shirts, this means ivory instead of white and warm pastels. Avoid colors that look cool or muted. Also avoid very dark colors for your suits–they will make you vanish into the background. Brown, saddle, and black for dress. Bright, lively color as accents such as red orange, gold, bright blue, deep coral or bright green, mixed with neutrals like tans, olives and golden brown.